A break between school semesters, a lull in the frantic pace of work life, a winter that wouldn’t quit, an RV fresh off the maintenance shop & full of gas, and a suggestion from my sister-in-law – ‘hey – why don’t you go somewhere?’ – that it finally occurred to us. Why don’t we go somewhere? And that was all it took. We knew we wanted to be near the water. We knew we wanted the drive time to be minimal. That left for 2 choices. Either somewhere along the Cheseapeake Bay – or along the the Maryland ocean shoreline. Assageatue Island met the criteria. Unfortunately you have to book a reservation at the state park at least a year in advance. Aren’t people spontaneous anymore? Paddy with the help of his buddy “Google” discovered a private RV campground located 5 miles south of Ocean City, and 5 miles north of the Assateague Island State Park. We have no time to be picky. In less than 24 hours, we booked a reservation, stocked the RV, packed the essentials -which include a CatTrike, a hybrid bike, the Elliptigo bike, and 2 pairs of running shoes. Oh yeah – and Soxy, our cat. By 1:30PM, we had arrived – at Castaways. Not knowing what to expect, we checked in, and were assigned campsite 7B. 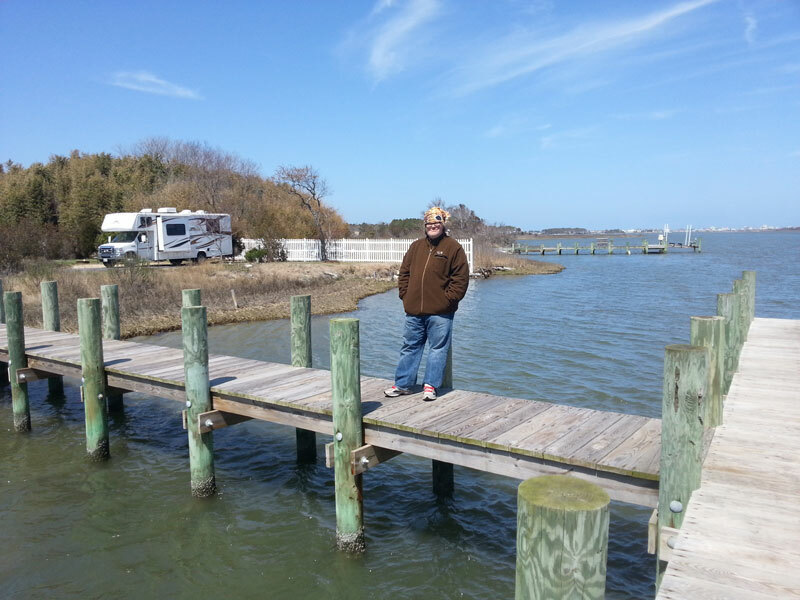 Campsite 7B, is located 15 feet from the waterway that divides the mainland (Eastern Shore Maryland) from the northern tip of Assateague Island. There were no other campers between us and the water, and there were so few campers overall in the campground – it felt like we had the place to ourselves. The location was too good to be true. 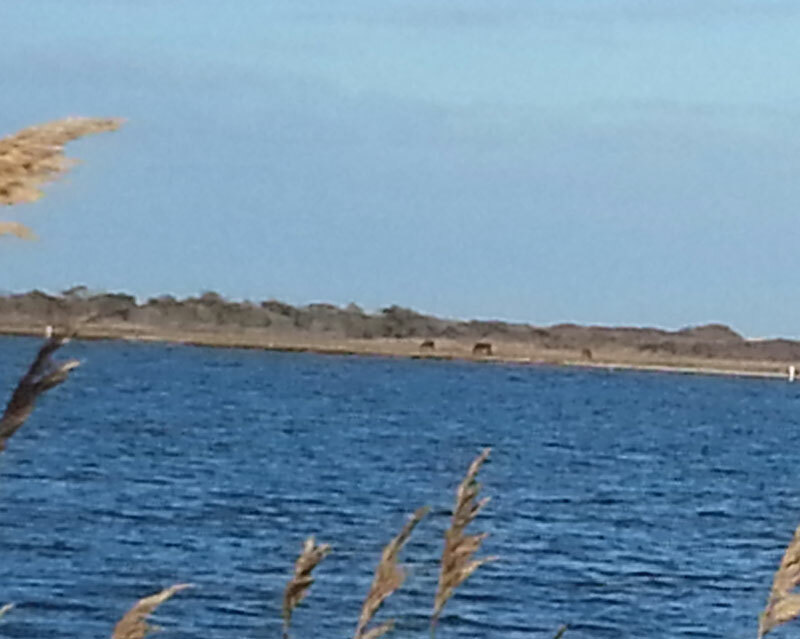 Looking across the waterway, was the most pristine, natural setting of dunes and tall grasses that make up the uninhabited national seashore – the norther tip of Assateague Island. Uninhabited by humans that is. As I scanned to our north, I could see a band of wild horses, roaming freely, feeding on the grasses. 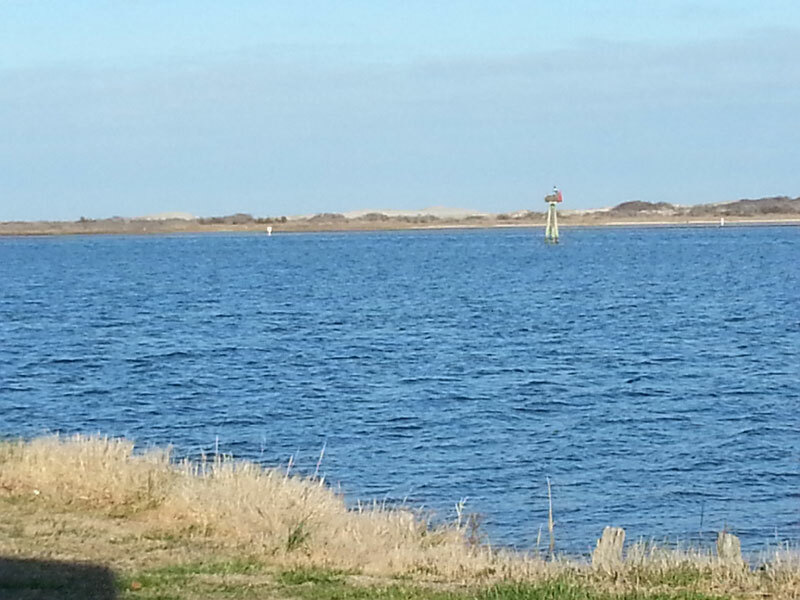 With the winds blowing 15 knots from the north, the roar of the ocean waves were breaking on the other side of Assateague Island – sounds we could hear from our campsite. I was instantly mesmerized by the sounds of the seas, and stopped checking my emails from that moment on. I pulled up a chair, having front row seats to this movie called nature. The Ocean City Inlet is 3 miles to our north, and it was easy to see the ebb and flow of the tides – ripping through the middle of the channel. At the backside of our campsite a thick mass of grasses and trees, which appeared to be home to untold species of birds – singing songs to the backdrop of the ocean breakers. After a few hours, the need for exercise, trumped my need for tranquility. We decided to pump up all the bike tires, choose a method of transportation, and let an adventure unfold. 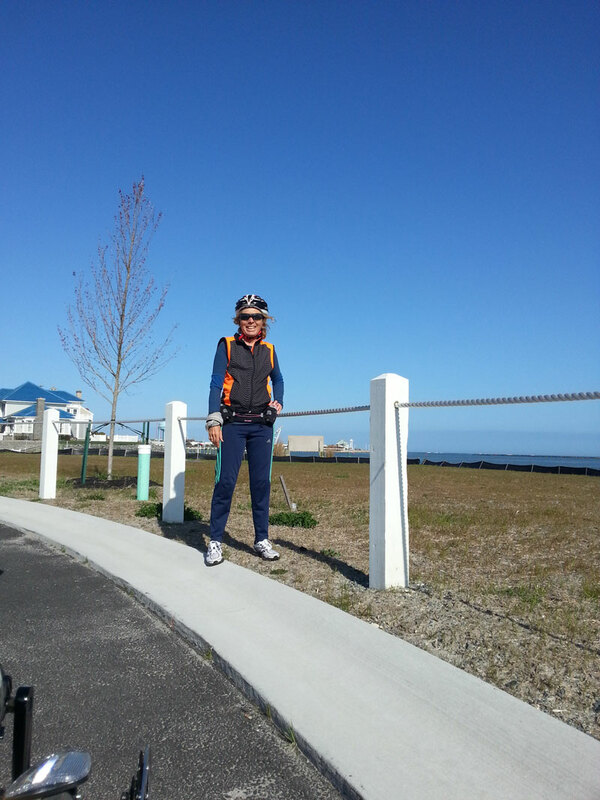 A trip to the Ocean City Inlet was the destination, with me on my Elliptigo and Paddy on the CatTrike. We traveled along the wide shoulders of Route 611 to Sunset Boulevard. Along Sunset Boulevard, the shoulders disappeared, and we danced with traffic until we reached the ‘strip’ of marinas and restaurants. 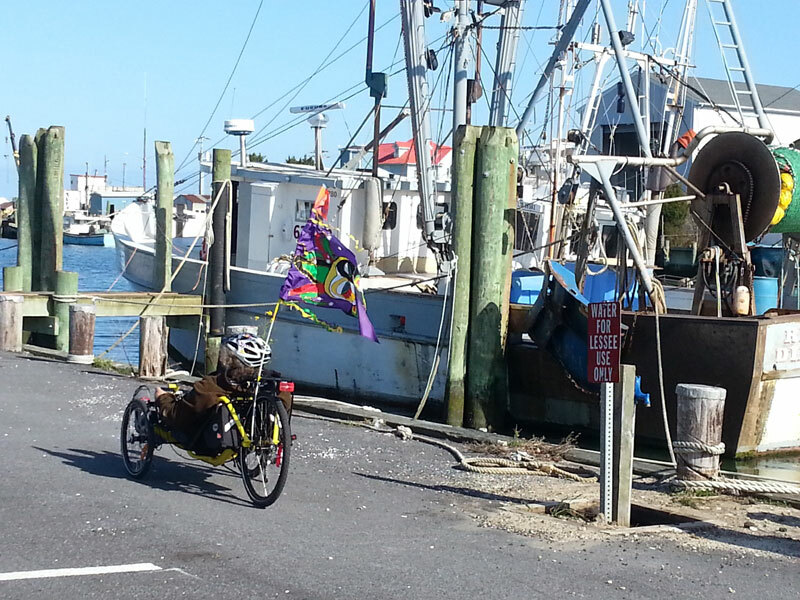 Here we discovered shrimp boats lined up along the dock-age of the harbor, and suddenly I was craving fresh shrimp for dinner. At the Sunset Grill, a wrap of fresh shrimp, avocado and grilled vegetables was calling my name. 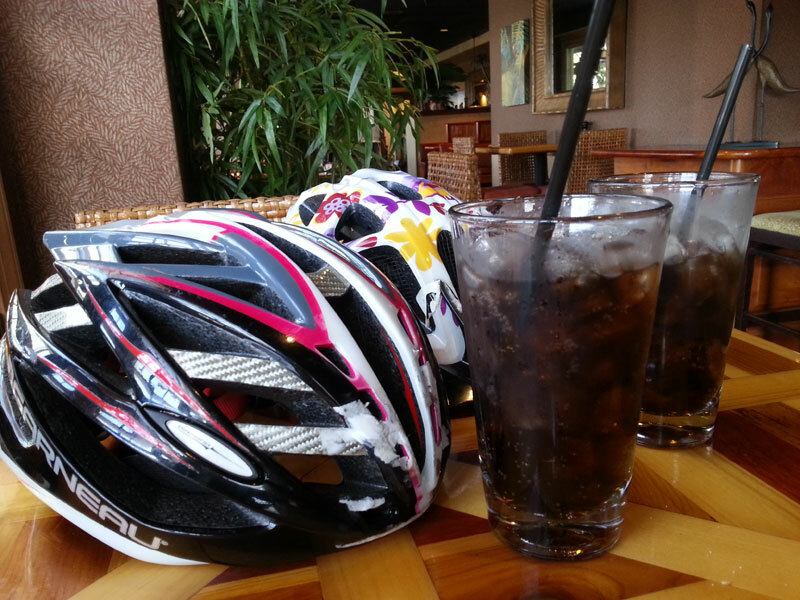 As we waited for our food-to-go order, we sipped on diet cokes, and wondered how we would carry our dinners home the 5 mile ride to our campsite. Surely it will all work out, and it did. With our dinners in containers, and in a bike-friendly bag (handles), we biked our way back to the campground. We consumed the most sumptuous dinner, in front of our private -o natural – views of the water, Assateague Island, the ponies, and sounds of hundreds of bird species singing their songs. For this brief nugget of time, we have Castaway.